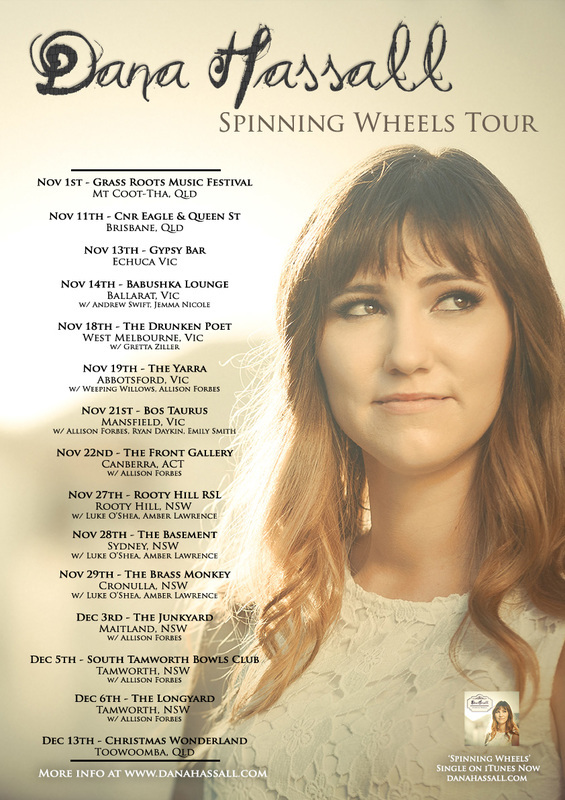 SPINNING WHEELS is the first full length album from this exciting young artist. It's nearly here and it's been well worth the wait. Get the album by ordering it right now from the Shop tab! Or get both the album and the EP for a SPECIAL PACKAGE DEAL! Join the Dana Hassall mailing list! Look out Canberra, a cool gig is coming your way! Luke O'Shea is one of my favourites and that man sure can tell a story. I can't wait for this show. Get your tickets ASAP right HERE. The 9 time Golden Guitar winner in a close up intimate acoustic setting, bringing his unique storytelling, his wicked sense of humour and his powerful performance and his classic Aussie sound. You can come for just the show or book a 2 course dinner and show. The Tamworth Country Music Festival is almost here! Prepare your mini fans and sunblock because it's gonna be a hot one. Aaaaaand pop one (or more) of the shows above into your schedule. Like Snow Music Video is here! The Like Snow music video is finally here!! Like Snow explores the wintery wonderland of a snow globe and compares it to everyday experiences in the real world. The song was co-written with Golden Guitar winner Luke O’Shea and a different version is also featured on his album ‘Caught Up in the Dreaming’. The video was produced/written by Dane Liepins and directed/shot/edited by Simon Cadman. Filmed at the popular Corin Forest Mountain Resort, a short drive from Canberra, the video captures the snowy magic of the inside of a snow globe and perfectly compliments the stoic mood of the music. Dana Hassall grew up on an alpaca farm in country Queensland and since moving to Canberra early last year the former Toowoomba local has been making a mark on the ACT scene. Between touring, playing locally, and learning to snowboard, the full time musician has been keeping herself pretty busy. The Northbound tour is up and out there in the world! Mark the dates in your diary of choice. I'll be hitting the road later this month, starting with a run south of Canberra. The shows will be mostly duo shows with my main drummer man, Jesse, but we shall be joining together with a full band in the capital cities. I can't wait to get out and see you lovely people! The Northbound tour will be announced shortly! For those of you who follow me on Facebook, you're probably aware that I moved from Toowoomba to Canberra last year. You'll have to ask me the story of the move in person sometime, but rest assured, I love the cold and I'm happy as a rubber ducky in the water through Canberra winters. 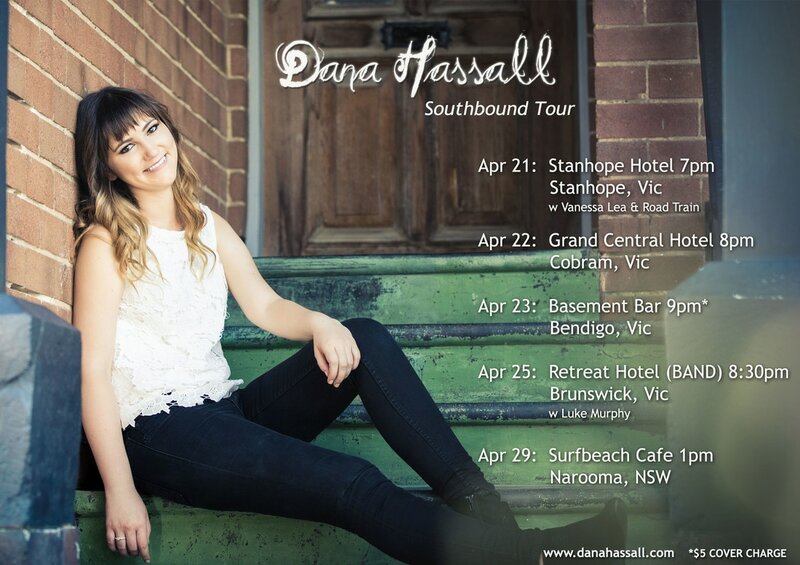 Dana Hassall is a finalist in the 2016 Southern Stars Awards with her single "Get Lost". This is Dana's second appearance in the Independent Rising Star Female category, after reaching the finals with "Spinning Wheels" last year. The awards will be announced at the Mildura Country Music Festival in October. ​Recently, I teamed up with Andy Schrav to record an acoustic version of one of the songs, from her latest album “So Far Gone” at a lovely little hall on the Gold Coast in Queensland. We set up an iPad using nothing but the UR22mkII with Cubase AI 8 and Cubasis LE, and Andy popped in some colours later with keyboard and backing vocals. Big thanks to Steinberg and Andy & Hazel Schravemade for putting this video together! A music-loving public joined forces with the Queensland music industry last night to celebrate the state’s finest artists at the annual Queensland Music Awards. The awards recognised Queensland artists across a multitude of genres, including Country, Pop, Rock, Blues/Roots, Heavy, Folk, Urban, World, Hip Hop, Dance and Jazz. Spinning Wheels, the title track of Dana's new album, was up against some stiff competition for the Country Award, with fellow artists Brad Butcher, Dana Gehrman and Sian Evans in the top 4. And she won! 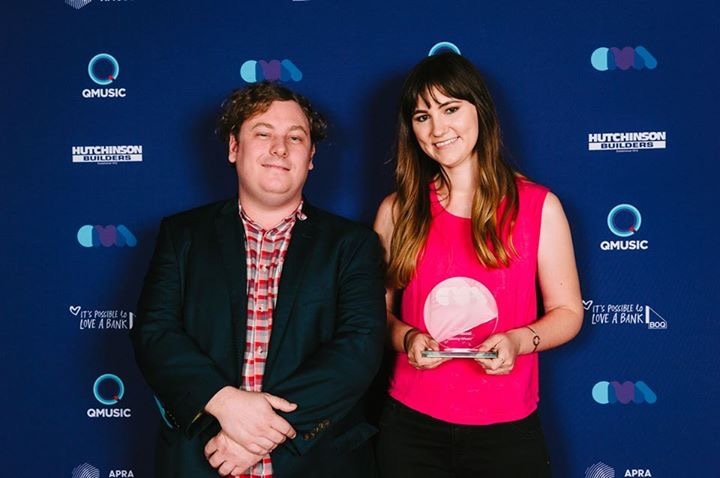 The picture above shows Dana with Andrew Tuttle from APRA, who presented her with the award on the night. A huge thank you to Qmusic for hosting the awards and for supporting Queensland artists day in an day out. 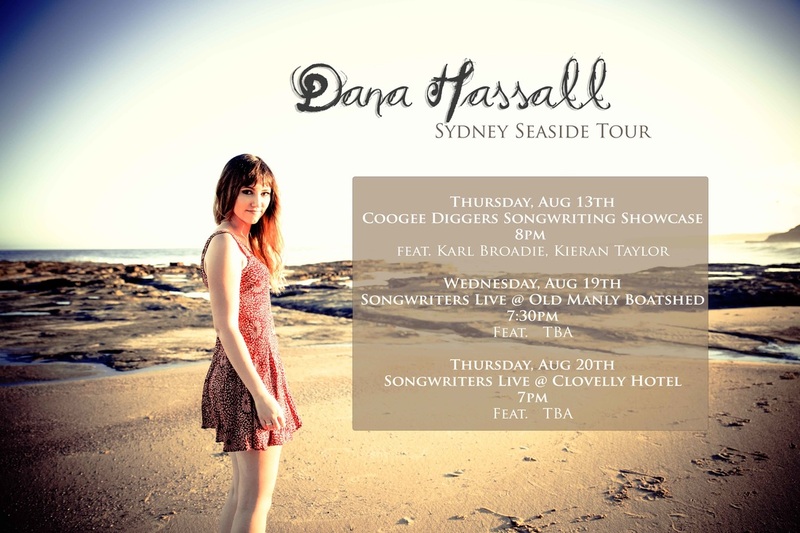 ​Dana Hassall's brand new album is nearly here! 10 self-penned tracks of Alt-Country/Folk-Rock goodness will be released on January 15, with launch dates to be announced shortly. The Tamworth Festival is only a month away and I can't freaking wait. Here's where you can find me playing... Oh and my new album will be out then too!! I'm super excited to announce I'll be hitting the road in November and December. I've been wanting to jump in my car and do this for a while and it's finally happening - with a little help from some friends along the way! If you're in Vic, NSW, ACT or Qld, come along to one of the shows and say hello. I'd love to meet you. :) More details about the shows are right here on the Tour page. 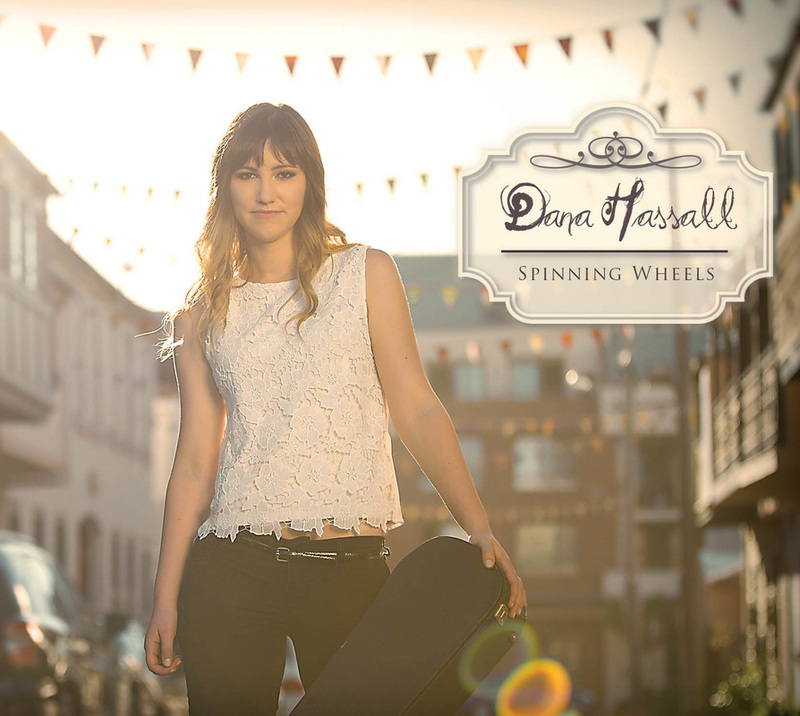 Americana singer/songwriter Dana Hassall releases ‘Spinning Wheels’, the title track from her forthcoming debut album. The self-penned single, ‘Spinning Wheels’, comes from that twenty-something feeling of wondering whether all your effort is going to amount to anything, but soldiering on even when it feels like you’re getting nowhere. The forthcoming album, due for release January 2016, will be Dana’s first full length record and sees her return to multiple Golden Guitar Award winning producer, Matt Fell, who also produced her EP ‘See It Now’. Being released simultaneously with the single is the music video for ‘Spinning Wheels’, directed by rcstills. Filmed both in Brisbane and picturesque Canada, the video portrays the soul searching we all must go through before figuring out where we need to be. Spinning Wheels Behind the Scenes! The release of Spinning Wheels is just around the corner, which means it's time for a little behind the scenes sneak preview from the set of the music video. Directed by RCStills, the filming of the music video was an intercontinental affair, with most of the footage being taken in Canada. Here are some of the shots from the Canadian shoot and a couple from right here in Australia as well! Dana has been announced as a finalist in the 2015 Southern Stars Independent Country Music Awards with her single "Gotta Take a Minute". The awards take place during the Mildura Country Music Festival, held from 25 September to 4 October, with the awards night being held on 3rd October. 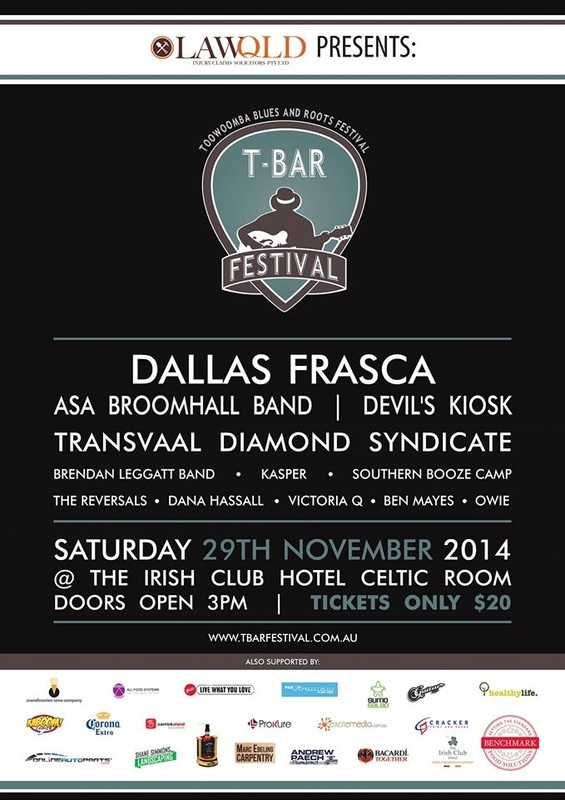 For a full list of the finalists visit the Mildura Country Music Festival website. I'm in Sydney for a couple of weeks! Why you ask? Well because I'm in the studio recording the rest of my brand spanking new album. But no one said I can't play some gigs while I'm here! Dana has been announced as one of 5 finalists in the Most Popular New Talent category of the ICMA Awards. The completely fan voted awards are a great opportunity for fans to speak out and support artists, radio announcers and producers that they really appreciate. The next round of voting commences on August 3rd and will run until November 1st, with the winners being announced during the Tamworth Country Music Festival in January next year. Dana is nominated alongside Caitlin Shadbolt, Emma Jene, Gretta Ziller and Michelle Plozza. For a full list of finalists, visit the ICMA website here. The music video for Gotta Take a Minute is finally here! Huge thanks to Victoria, Ashlee, Megan and Regan for being my jam buddies and to Karli for the filming/editing/directing/general awesomeness. And a big thank you to all the lovely folks who came to our little backyard concert! I hope you have as much fun watching this as we did making it! Every two years thousands of folks flock to Chinchilla for a week of Melon-y Madness. This year, Dana got to be a part of the fun! Dana entertained crowd of some 8000 people at the Saturday night Family Concert as part of a stellar lineup, featuring X Factor runner up Dean Ray and country sensation McAlister Kemp. A great time was had by all, with plenty of watermelon to go around! Dana Hassall has been revealed in the 2nd Artist Announcement as one of the great artists playing at this year's Urban Country Music Festival. 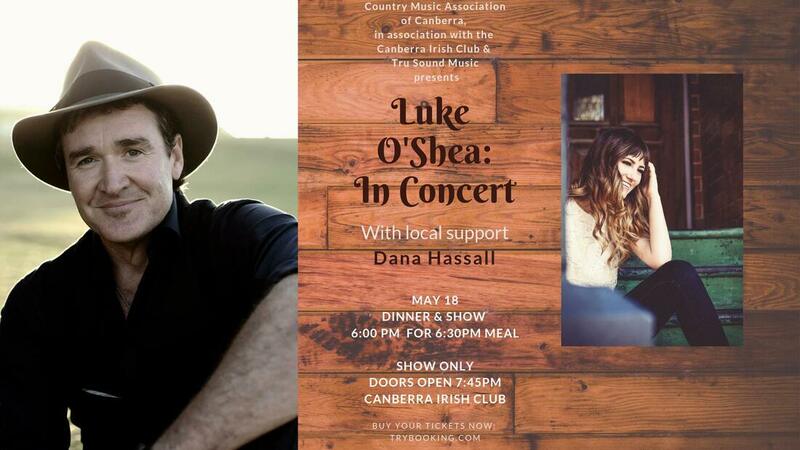 Dana will be joining a lineup headlined by Lee Kernaghan, Beccy Cole, Augie March, the Sunny Cowgirls and fan voted Christie Lamb, The Jay Seeney Band and Liam Brew. The Village Stage and the Songwriters Cafe are the two places you can catch Dana at the festival. Tickets can be purchased for each day or a 3-day weekend pass is only $75! Who's coming to party at Urban Country Music Festival? Dana Hassall has been selected as one of the Top 3 in the Toyota Star Maker 2015 competition and will perform in the Grand Final at Toyota Park on Friday 23rd January. The other two finalists are Mickey Pye and Gretta Ziller. Today Dana Hassall was announced as one of the top 10 finalists in Australia's biggest and most prestigious country music competition, Toyota Star Maker. This year Toyota celebrates 20 years of support of Star Maker which offers emerging country music talent the opportunity to realise their dreams. It’s helped launch the careers of some of the industry’s biggest names including Lee Kernaghan, Keith Urban, James Blundell and Beccy Cole. The final is set to take place on Sunday, January 18 where three grand finalists will be selected to compete in the Toyota Star Maker grand final on Friday, January 23 as a part of the Toyota Concert For Rural Australia before the winner is announced. Entries from across the country have gone under the microscope with a panel of judges selecting the 10 finalists. The Toyota Star Maker Final will be held at the Tamworth Town Hall from 7pm on Sunday, 18 January, 2015. The final will feature the Top 10 and former winners Tanya Self (1995), Kirsty Lee Akers (2007) and Jared Porter (2014) and compere Darren Coggan (1996). Standard and Premium Tickets for the Final 10 are available from www.entertainmentvenues.com.au or phone 02 6767 5300. 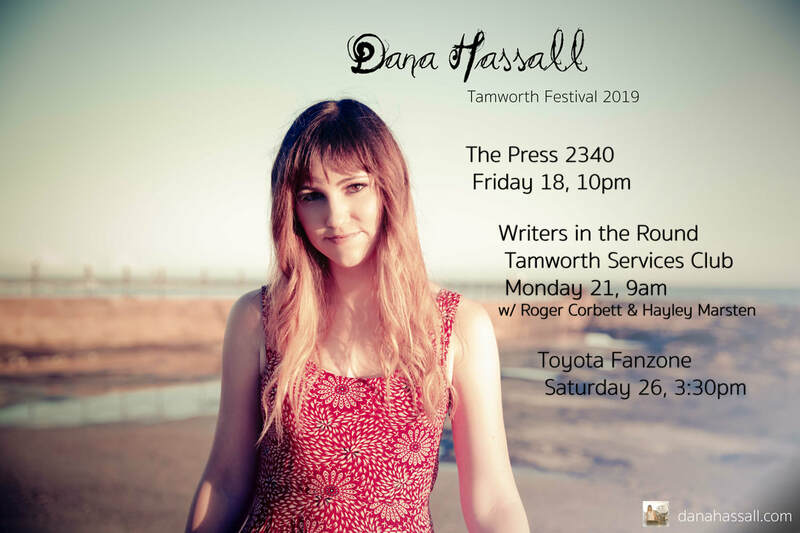 Tamworth Country Music Festival is coming around again and there are plenty of chances to catch up with Dana at the 2015 festival. Among Dana's 10 performances are the prestigious Toyota Star Maker (Tix: www.entertainmentvenues.com.au), the Women of Song showcase featuring Jen Mize & fellow Toyota Star Maker finalist Gretta Ziller (Tix:www.trybooking.com/GIXX), the Storyteller Heroes show with a very special Surprise Guest and Tamworth Services Club Writers in the Round with Paul Costa & Matt Henry. It's shaping up to be a great festival. 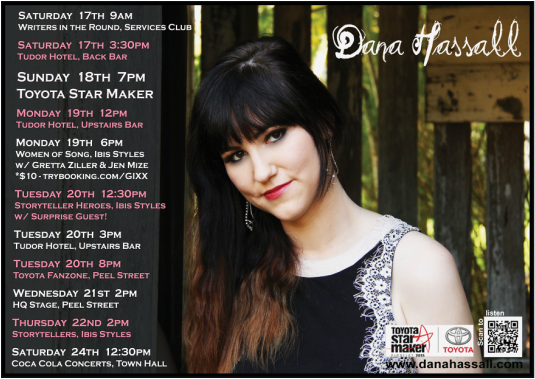 Make sure you put Dana's shows in your diary so you don't miss out! 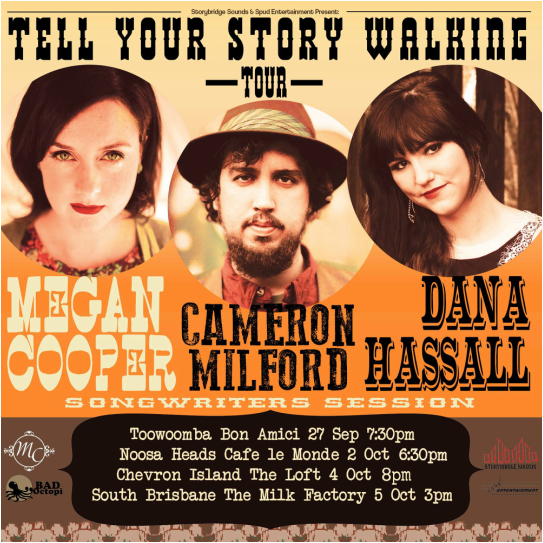 Storybridge Sounds and Spud Entertainment present the The Tell Your Story Walking ﻿Tour﻿ - featuring Megan Cooper, Cameron Milford and Dana Hassall. In the following months the singers will be bringing their songs and stories to audiences﻿ acr﻿os﻿s South East Queensland. Each artist has carved out a reputation for adding a modern twist to the sounds of country, folk and bluegrass. Cooper has gained critical acclaim for her most recent release, 'Ghosts, Choirs and Kings'. Milford has travelled the world as a wandering troubadour and drew numerous accolades for his album 'Highway Wind'. 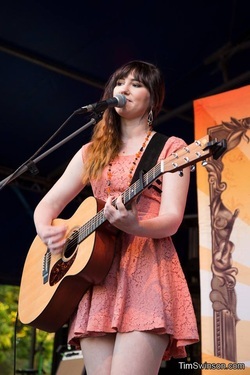 Hassall is a multi award winning artist who has been a prominent feature of the Australian Country Music Scene since releasing her EP 'See It Now'. The Tell Your Story Walking Tour will kick off at Bon Amicis in Toowoomba on 27 September. Expect delicious melodies, tall tales, sweet harmonies and a few laughs along the way. I recently played a full band set at the Urban Country Music Festival and after the show, I was joking around with the guys in the band about seeing them at the annual band gig next year. It's true, 99% of the time I play solo at my live shows. So I thought it would be cool to record all the songs from my CD in my bedroom and pop them up on YouTube. This is how I'm most familiar with playing these tracks and I wanted to share that with the YouTube world. The video in that YouTube box up there is the final one in the series! You can check the rest out in the Video section or at youtube.com/danahassall. In the videos I tell you a little bit about where the song came from and then play it for you with just me and my guitar. If you don't have my CD yet, physical copies are available in the Store and digitally from iTunes. Or just rock up and say hi at one of my shows! 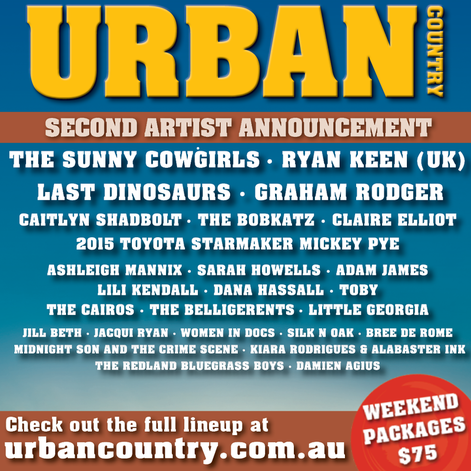 Urban Country Music Festival is done and dusted for another year! I was up on stage nice and early Saturday morning with a band set to wake everyone up. Early mornings are definitely not my favourite thing (I'm barely out of my teens after all! ), but I had a sip of coffee and off I went. And the weather was wonderful! It was awesome fun playing with a band again - the guys bring new life to my songs whenever we get the chance to play together. Thanks Rod, Sonic and Simon! Hopefully I'll catch you all back there next year! Once a year, live music floods the CBD of Toowoomba and I think it's possibly my favourite event on the Toowoomba calendar. This year was no exception. 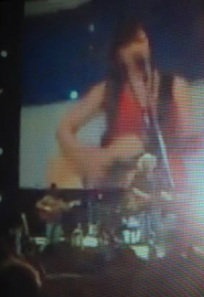 I had a blast playing my Easterfest shows with my little sister for some onstage company. 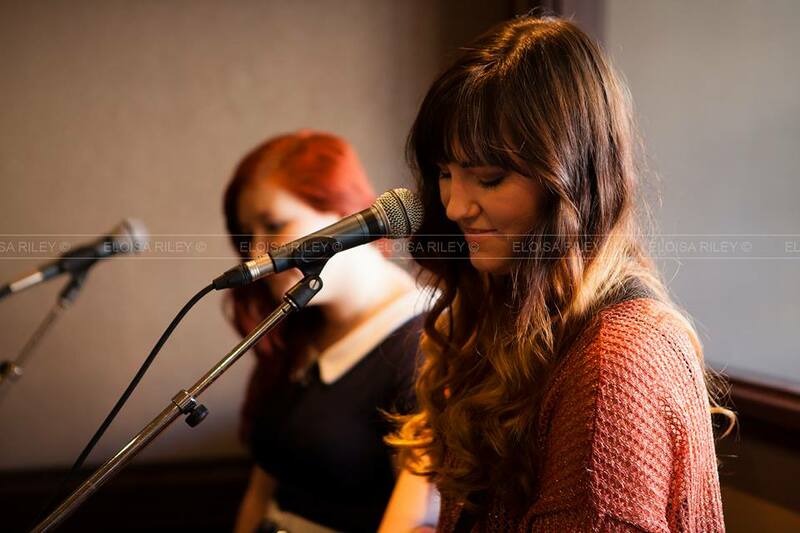 This picture was taken by Eloisa Riley during my set at Cafe Forte. It was a great turnout for this show. Thank you so much to those who came out to see me play over the Easter weekend! The moment you've all been waiting for!! 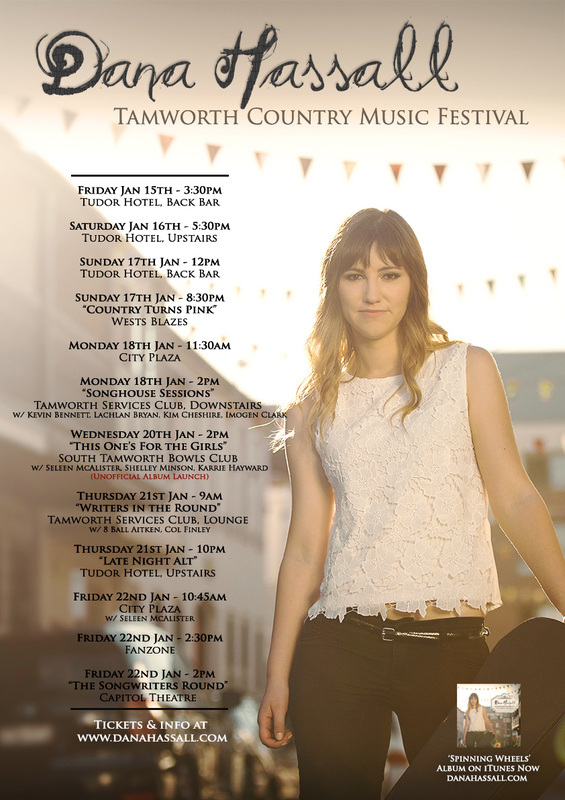 Here's a list of my shows for the 2014 Tamworth Country Music Festival. And they're ALL FREE!! I'm also singing in the gospel choir at the Carter & Carter Country Gospel Show at the Capitol Theatre, so if you love David & Merelyn, come along to that on Sunday 19th, 2pm too :) -it's not quite as free as the rest of my shows. But worth it! Crazy things happen during the week at Tamworth, so keep posted on the changes here on Facebook, or on the shows page of my website. Tamworth! Get excited! It's a long drive from Toowoomba to Deniliquin, but I packed up my little barina and hit the road . By the following afternoon I'd hit Deni ready for my first Ute Muster. And I had a blast! My set was heaps of fun, my only regret is that I couldn't be up there longer. Anyway, I headed back to the tent and popped on my dancing shoes before Alan Jackson's set. Little did I know I was in for a bit of a shock! The Toowoomba Heat of the Telstra Road to Discovery took place over the weekend as part of the Carnival of Flowers. I was honoured to be chosen to participate in the heat and as a result, I got to play a couple of my songs to a stellar crowd, and meet some cool new people in the process. Tim Swinson captured this moment during my performance. Unfortunately I won't be progressing to the next stage of the competition, but congratulations to Josh Rennie-Hynes for taking out the heat and to Grim Faulkner for winning the wildcard spot. Pretty cool news! Dana's song "Long Way" was selected as a semi-finalist from over 16 000 entries in the International Songwriting Competition. 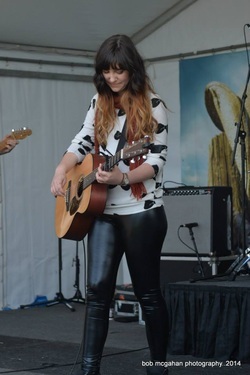 She stands alongside only 11 other Australian artists to make it to the semi finals of the Country section. You can purchase Long Way on iTunes or as part of the "See It Now" EP.